Instead of buying all of the items above separately, you can knock most of it out at once by buying a CA glue finish starter kit. 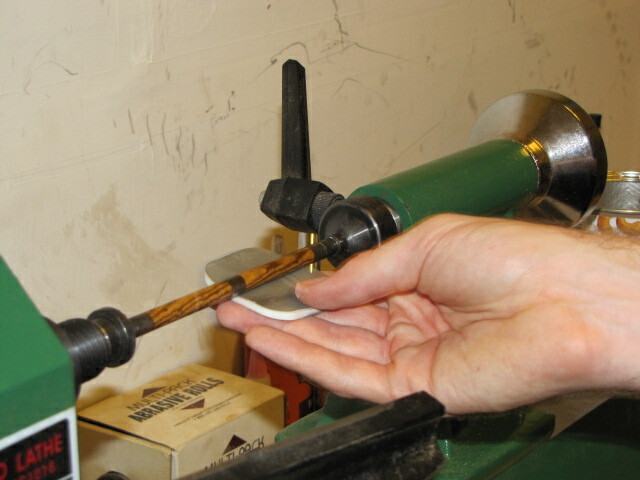 A CA glue finish is a very tedious and sometimes difficult process. It will take some practice to perfect. If at any time you feel like you’ve irreversibly messed up while applying a CA glue finish to your pen, feel free to sand it all off and start back from the beginning. I’ve done it before when I was first practicing a CA finish, so just chalk it up to a learning experience. 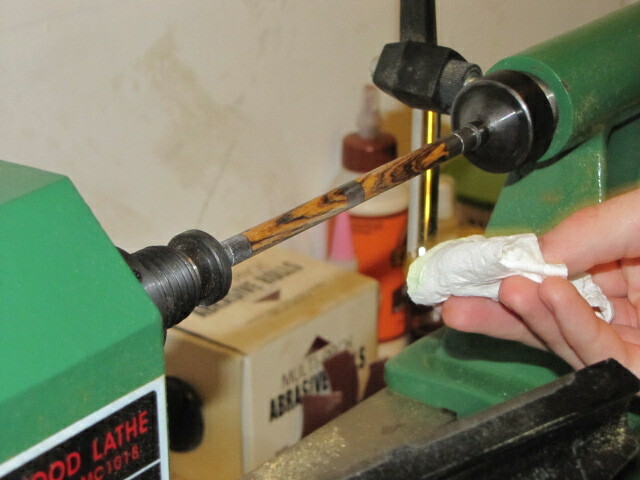 It seems every pen turner has a slightly different technique when it comes to applying a CA glue finish, but this is what I’ve found works best for me. I don’t use boiled linseed oil (BLO) and others swear by it. 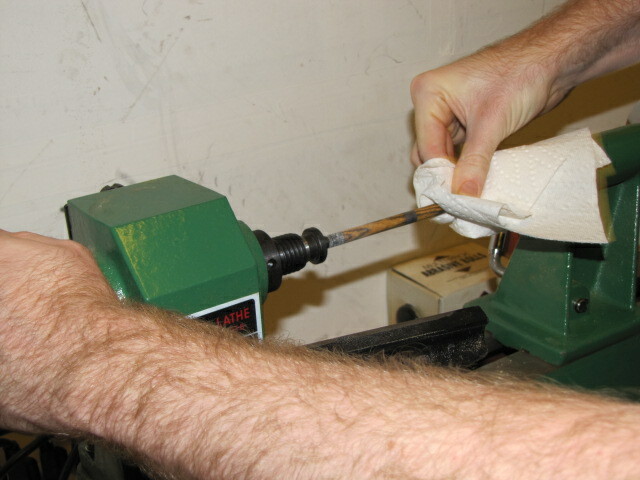 I apply my CA finish with my lathe off while many others apply with theirs on. Over time you’ll find what works best for you, but this tutorial should serve as a good starting point if you’re new to the world of putting a CA finish on your pens. Without further ado, let’s get down to it! 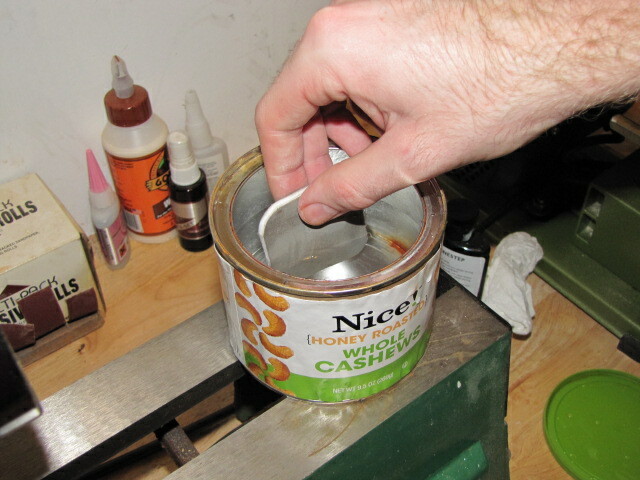 Scroll to the top of this page and click “Step 1” to read about applying the first layer of your CA glue finish. I can’t emphasize enough how much you don’t want to use cheap paper towels here. The first time I applied a CA glue finish to one of my pens I used cheap paper towels, and boy was that a mistake. I had fog or “ghosting” in my finished barrels because a patch of paper towel fibers got caught between a couple of layers and I didn’t notice it until it was too late. That was a sad, sad moment. 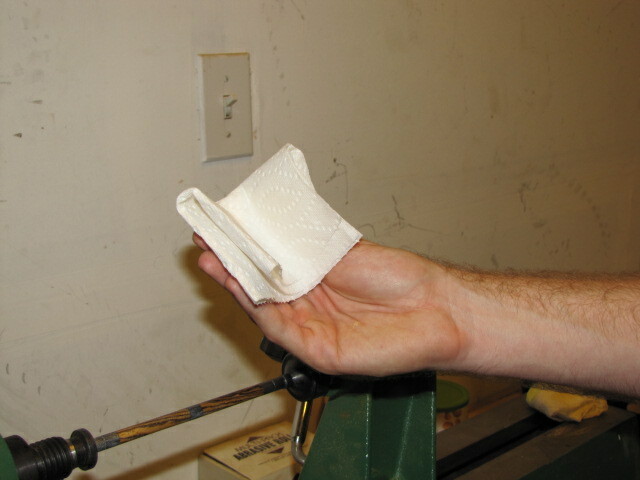 You can test whether your paper towels are high quality enough for applying a CA finish by folding up one of the paper towels a few times over and dripping 5-10 drops of CA onto it. If they’re too cheap, they’ll heat up so badly that they’ll start smoking a little. This is NOT what you want in your paper towels. If you don’t see smoke (make sure to watch REALLY closely) you’re in the clear. Also, I prefer thin CA glue over medium or thick. There’s some controversy on this topic throughout the pen turning community, but I’ve tried all three and I just can’t beat the results I get using thin CA glue. Sure, you have to apply a few more layers than you do when using thick CA, but your end results are almost incomparable. 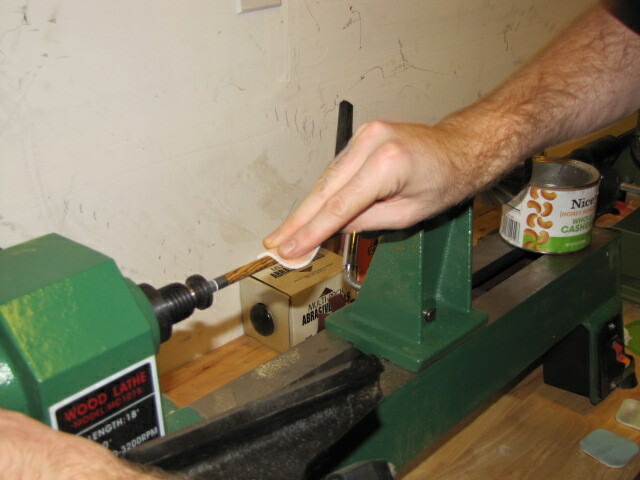 This whole process must move pretty quickly since the glue dries so fast, so once you’re in motion – stay in motion. Here we go. Drip about 5-7 drops of thin CA glue onto a paper towel you’ve folded over at least 4-5 times. If you’re using a piece of paper towel that you’ve torn into segments (like I am below), make sure you keep the torn edges off of your pen blanks. They leave behind extra fibers that can destroy your finish. 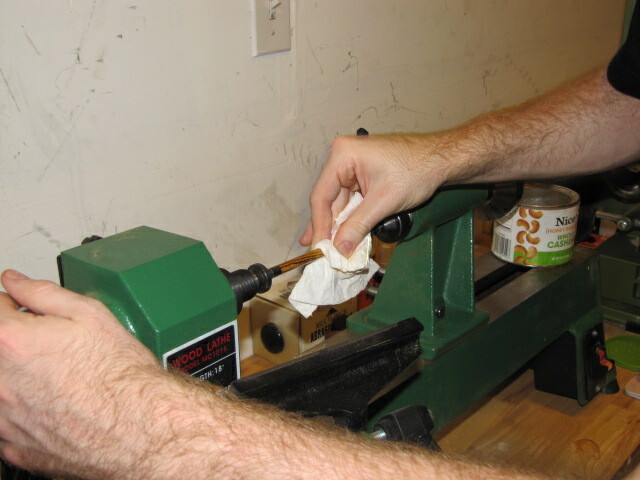 Take your paper towel to the first blank immediately, swiping it back and forth as quickly as possible while simultaneously turning the headstock handwheel. After you’ve done the first blank, get a fresh piece of paper towel, drip another 5-7 drops, and repeat the same process for the second blank. 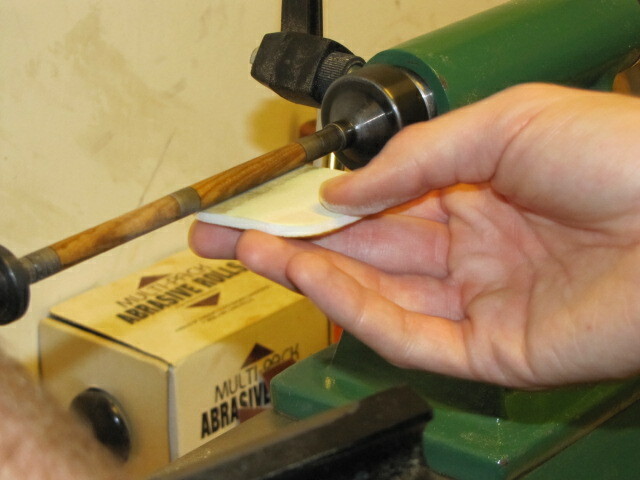 You only have about 3-5 seconds of time that the paper towel can slide across the blanks smoothly without beginning to bond, so swipe quickly and turn the handwheel quickly, while also making sure that you coat the entire blank. 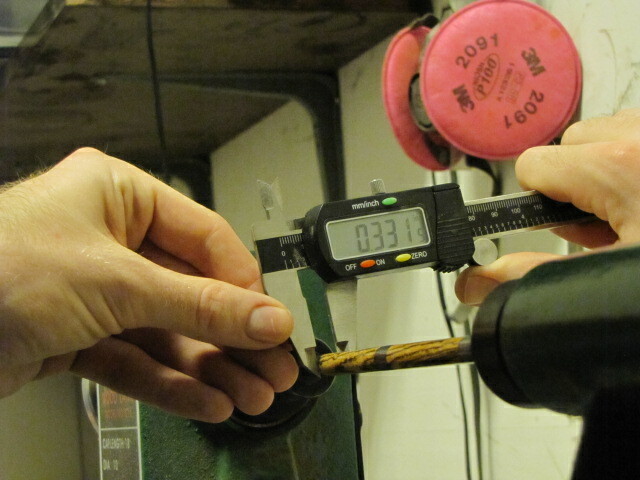 Don’t worry about getting the CA glue on your bushings either. They might all bond together, but that’s easily fixed after this process is finished. I’ll show you how when we get start the assembly section of this tutorial. 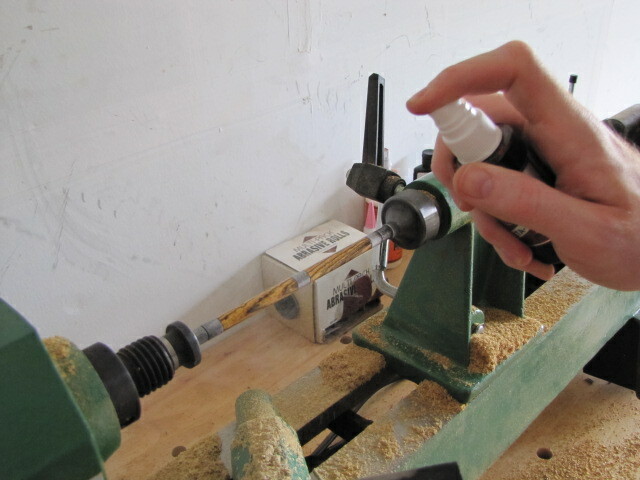 As I said, I don’t turn my lathe on at all when I’m applying a CA glue finish. 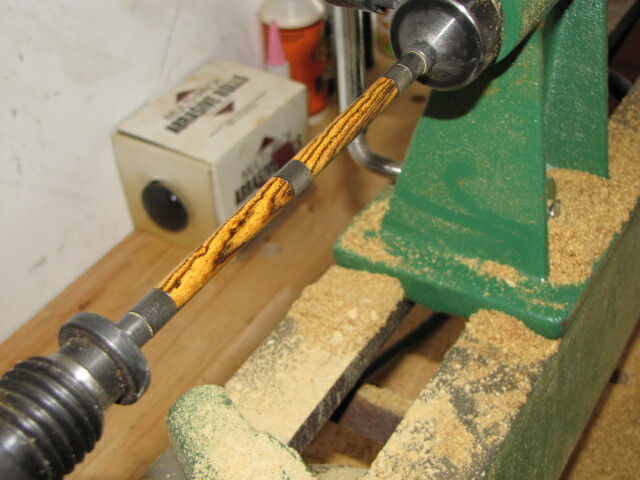 I don’t want to sling CA glue everywhere, especially not all over me or my lathe. Just make sure you work quickly. If at any point you feel the paper towel beginning to stick as your sliding back and forth, remove the paper towel from the surface of the pen blank immediately and make sure you don’t have any paper towel fiber clusters on your blank. 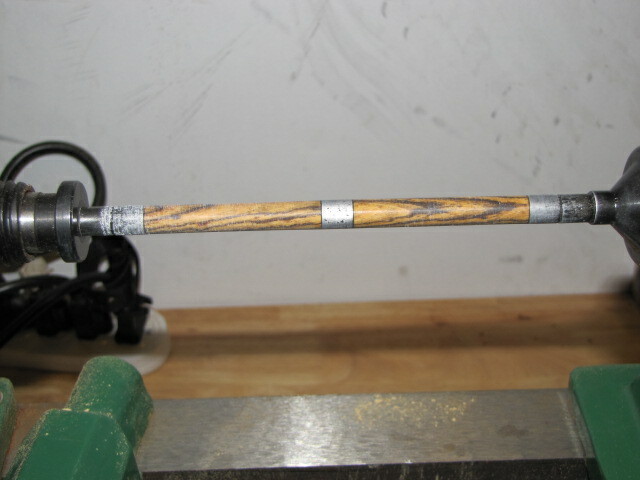 You’ll see some fibers here and there if you look at your blanks from the right angle, but don’t worry about that. It’s perfectly normal. If, however, you see large, white clusters of fibers stuck to your blank anywhere try to scratch them off before applying another layer. If you can’t get them off, you probably need to sand your CA glue finish off and start over. Remember, this takes some practice. Give the blanks 1-2 minutes to dry between applications then repeat this process three more times for both blanks. Your first layer should have a total of four applications of CA glue to each blank. After you’ve finished the fourth application, give each blank 1-2 sprays of accelerator. 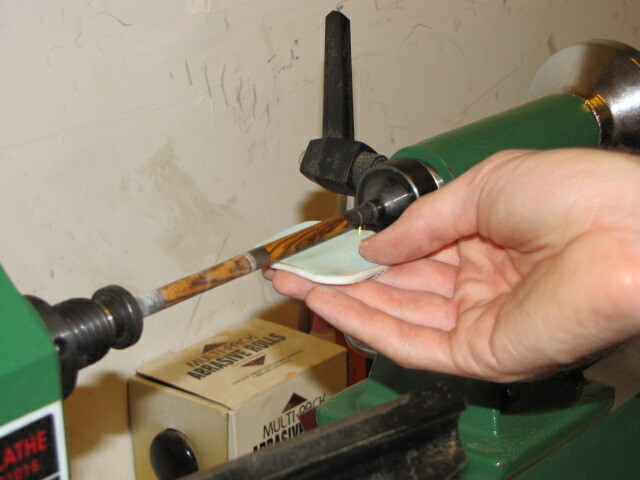 Let the blanks sit 1-2 minutes before moving onto the next layers. 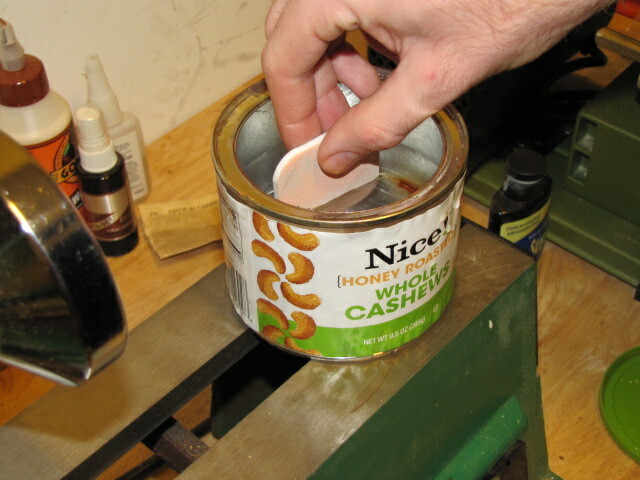 Scroll to the top of this page and click “Step 2” to read about applying layers 2-4 of your CA glue finish. Just like many other things with pen making, it’s time for a little repetition. The only difference here is that instead of four applications per layer, we’re only going to do two per layer for layers 2-4. The process is the exact same though. VERY IMPORTANT: Make sure your blanks are 100% dry of accelerator before continuing. 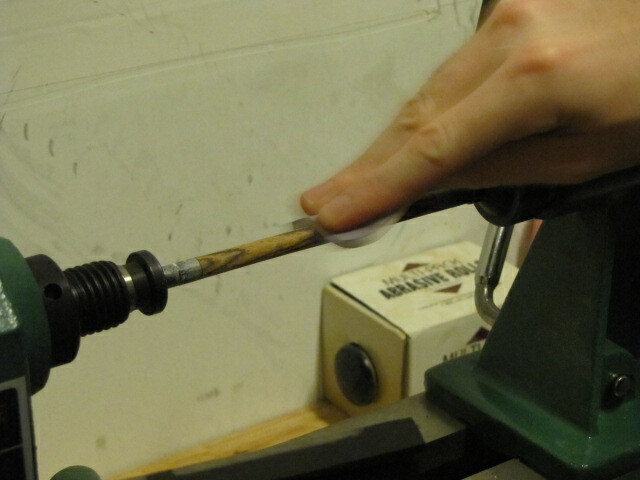 If you touch your paper towel with CA glue on it to a spot of non-dry accelerator, that paper towel is going to bond to your pen blank instantly and you’ll have no choice but to sand it off and start from the beginning. 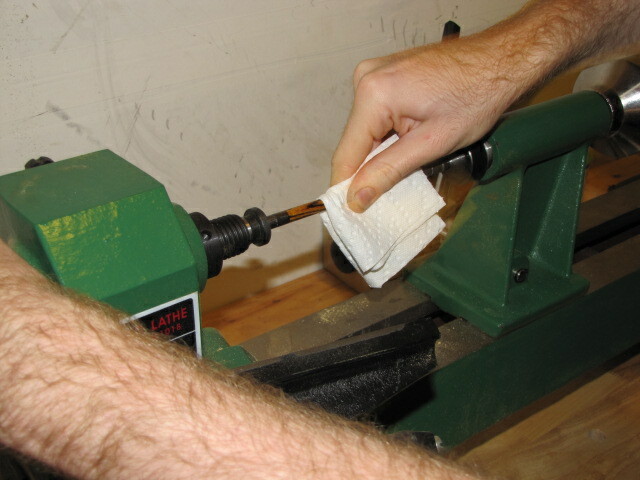 Apply that paper towel to your first blank moving back and forth rapidly while turning the headstock handwheel. Repeat the same steps for the second blank. Give the blanks 1-2 minutes to dry, then apply another coat. After two coats have been applied, spray your accelerator on there and wait another couple of minutes. Apply two more layers of two coats each and you’re done (for a total of one primary, thick layer and three thinner layers). 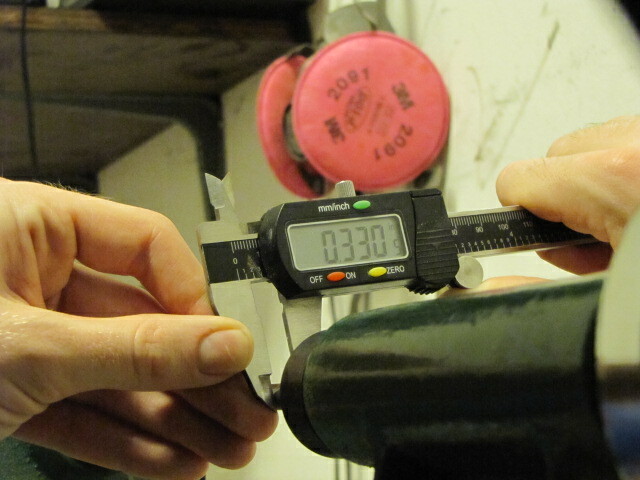 If you’d like, you can take your digital caliper and measure the diameter of your blanks to ensure you don’t need to add anymore layers before leaving them to dry. 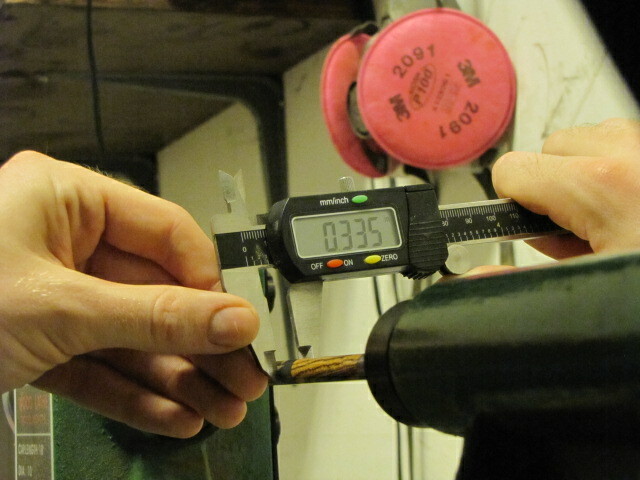 You want to make sure you have around .002″ OVER the thickness of your pen kit accessories to allow room for sanding. 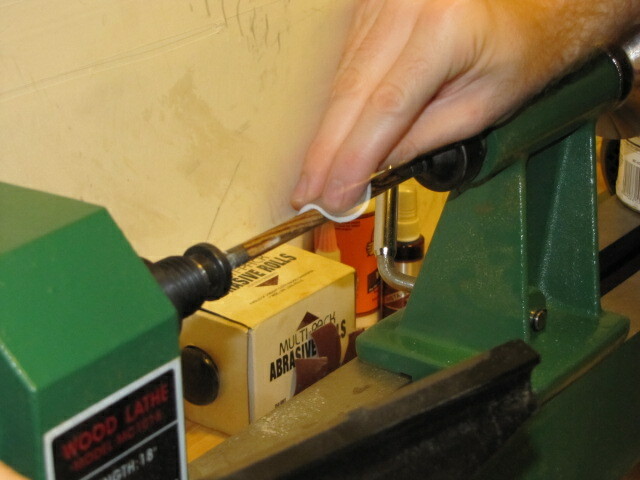 I did this off-camera, but for me it’s an important step to ensure a flush finish when my pen is assembled. If you leave an indentation, let it sit for another hour or two, or possibly overnight. 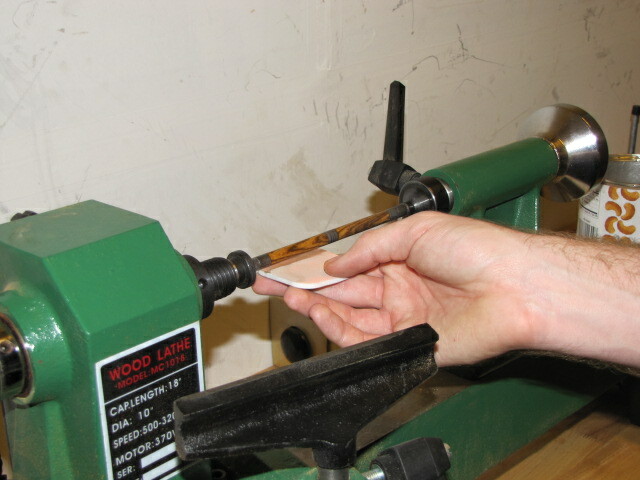 If your CA finish is unaffected by the fingernail test, it’s completely cured and time to move onto sanding! 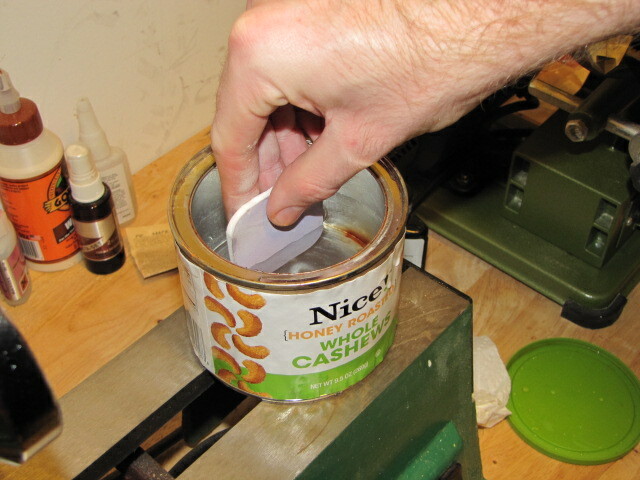 Scroll to the top of this page and click “Step 3” to read about sanding your CA glue finish. 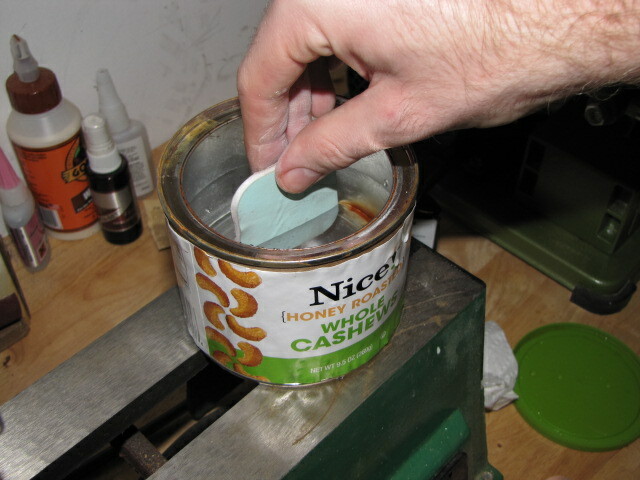 Start by taking your micro-mesh sanding pad and dipping it in a little bit of water. I usually start with 800 grit. 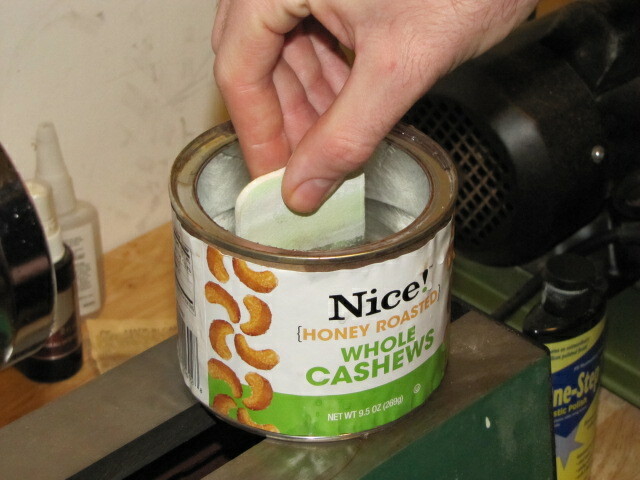 And you thought I kept honey roasted cashews on my shop table this whole tutorial, didn’t you? 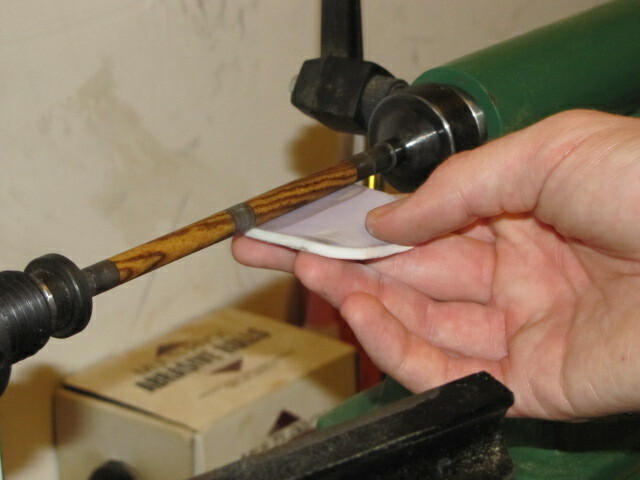 After getting it a little moist, gently touch it to the surface of your pen blanks. 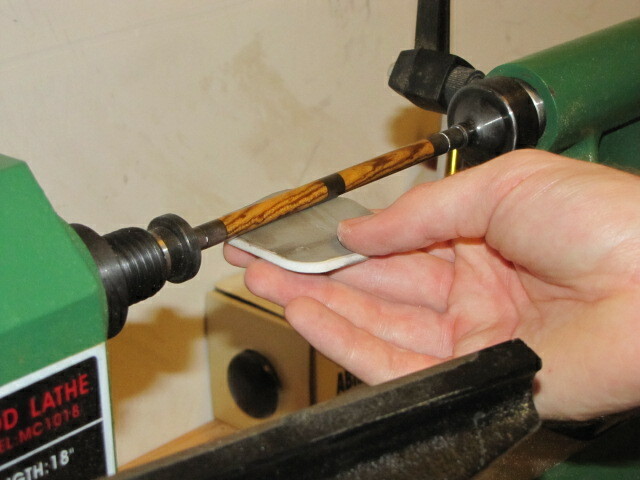 You shouldn’t be applying any pressure at all at this stage – just enough to keep the sanding pad in place. Sand with this grit for 30-45 seconds per blank. 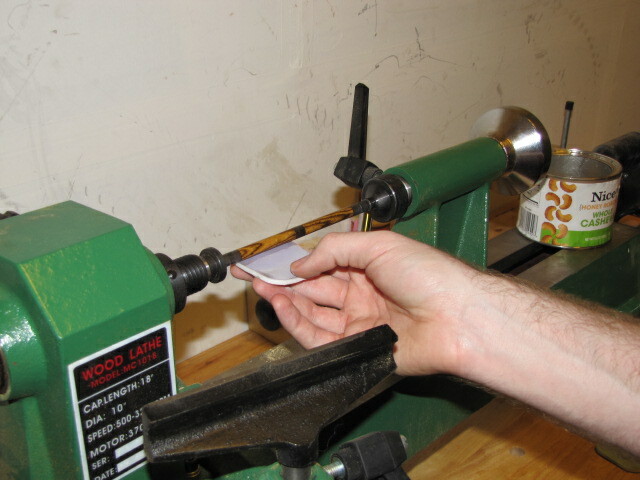 Keep the lathe running and give the second pen blank 30-45 seconds as well. 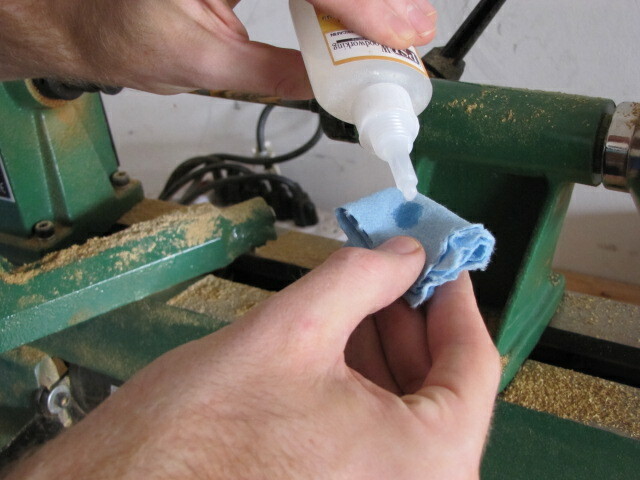 After you’re done sanding, you’ll notice a little slurry has hazed up your blanks as you were sanding. Make sure to wipe this off before continuing. These fine specs of dried CA glue can scratch your pen up a bit, so we want to prevent contamination between layers of sanding. Cheap paper towels are fine here. Even after you remove this slurry, you’ll notice that your blanks aren’t shiny anymore. Don’t freak out – that’s perfectly normal. They’ll be shinier than ever by the time we’re done sanding. Repeat this entire process for the next level of grit. For me, that’s 1500. 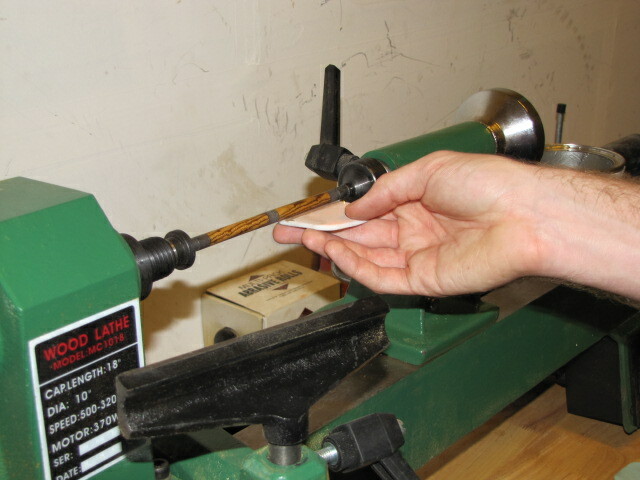 After you’ve sanded for about 30-45 seconds on each blank with the lathe on, we’re going to use the same technique we were using earlier to remove any fine scratches while the lathe was on. 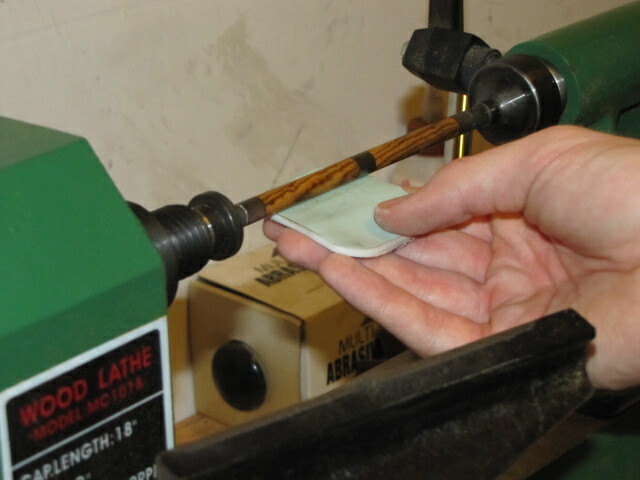 With the lathe off and completely still, sand each section of the pen blank manually by swiping back and forth quickly 10-15 times for each section. This may be overkill for some people, but I’ve finished pens that had hairline scratches all of the way around and it HAUNTS me until that pen disappears one day. This is how I ensure I have a perfectly clear, perfectly clean, scratch-free CA glue finish when I’m done. You’ll notice that your glossy sheen is beginning to return. Repeat this entire process for the next level of grit. For me, that’s 2400. Remove the slurry and move onto your next grit. For me, that’s 4,000. 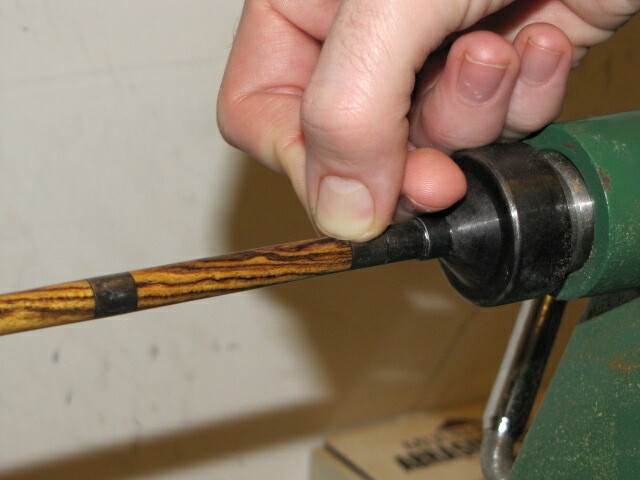 Now you’ll notice an unbelievably beautiful, glass-like, scratch-free finish on your barrels. I usually finish this off by adding 2-3 layers of plastic finish. 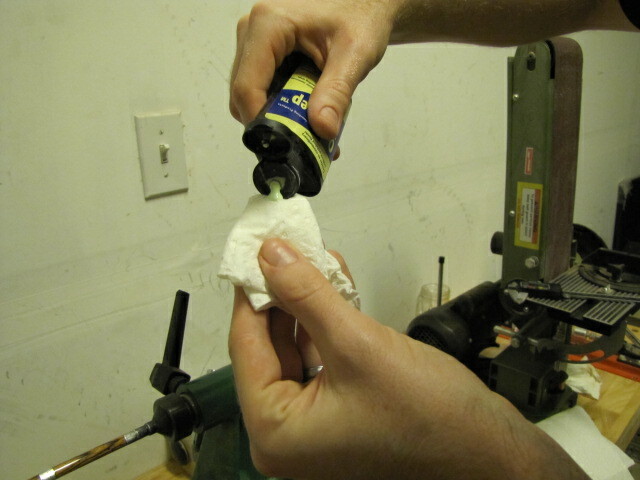 You simply put a little on a paper towel, apply manually just like the CA glue, wait 30-45 seconds while it dries to a haze, and then buff it out with a cheap paper towel by applying some pressure and sliding back and forth quickly while turning the headstock handwheel until you feel the heat from the friction. 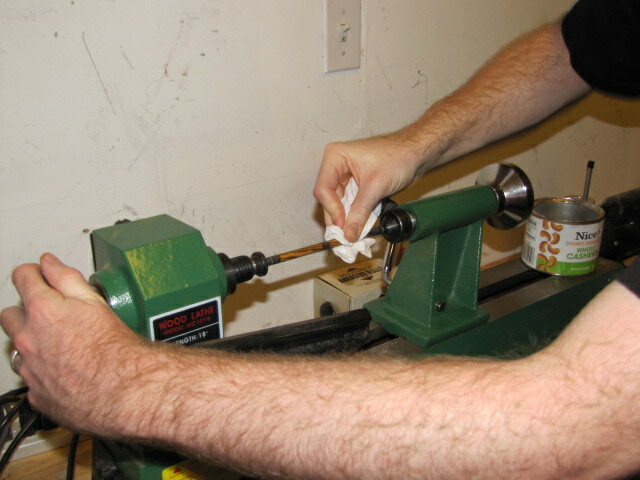 Again, many people do this with the lathe on. 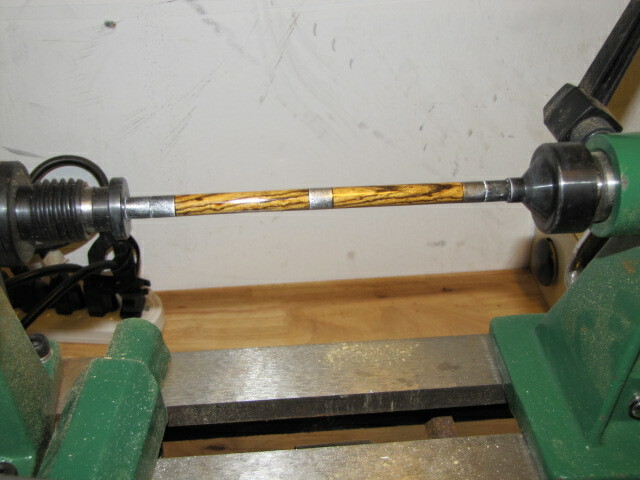 I suppose that is fine, but I have done it with the lathe on and noticed those hairline scratches circling all around my finished barrels, so I prefer to do it with the lathe off. If nothing else, it’s a little cardio. 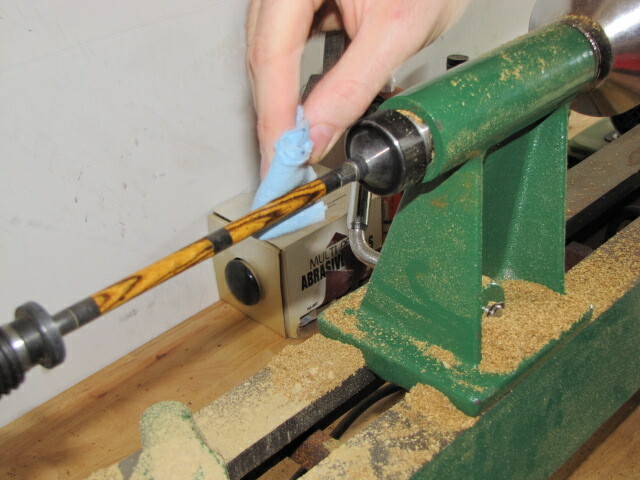 Repeat this process 1-2 more times, and then give the ends of your blanks one final measurement to make sure everything is going to meet up flush when we come back for assembly. We’re spot-on for all ends, so I’ll leave this to cure completely for 24 hours before I come back tomorrow and assemble. PTT, thanks so much for the tutorial; I have used it extensively to create my first 3 pens and plan to do more. I do have a question…I used buckthorn in my 3rd pen, and the orange color changed to brown. I think this happened during the high grit sandpaper use with water towards the end of the project. With your experience, do you think the water or…somehow…heat turned the color dark? Could the CA have done it when it got wet? If you have another idea, I could use the advice. I am a novice, so thanks for the readily available information you have shared. refer to? Brand name? I’ve never used anything other than varithane or such. Yours looks like a white paste? Sounds like a very good final finish. 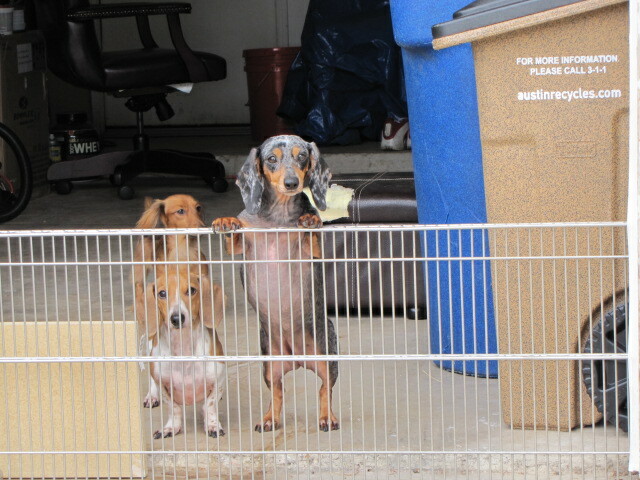 Hey Austin! It’s just the One Step Plastic Finish that Penn State Industries sells. I hope that helps! Ian, your process has opened my eyes a bit. Think I was doing it all wrong. Can’t wait to get home to polish a pen or two. 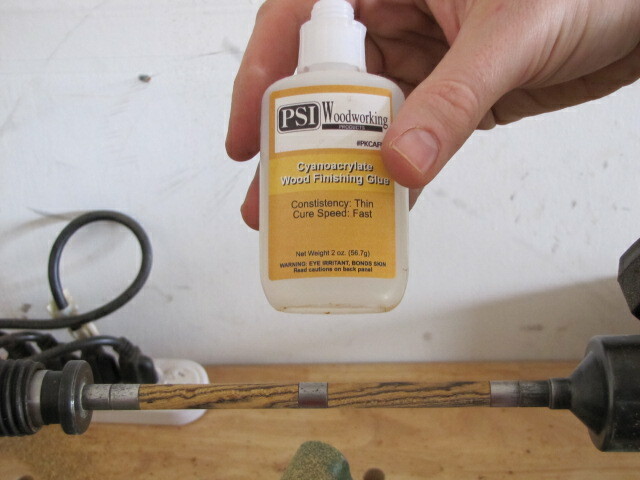 Does it usually take a couple hours to cure with all ca glues? If I’m in a hurry, I can work them within a few minutes if using a layer of accelerant in between each layer of CA (and the CA layers aren’t going on too thick), you can work them without letting them cure for 24 hours.